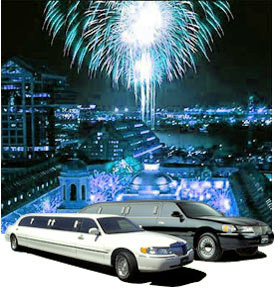 Limo hire for Christmas and New Year celebrations. Enjoy the Christmas spirit without the hassle of driving or parking.. Enjoy the Christmas spirit without the hassle of driving or parking. Limos for Xmas and New Years.. Welcome to our Christmas and New Years section. Whether you are celebrating Christmas with the family or heading to London's Leicester Square for the New Year celebrations, we can organise the ideal chauffeur driven transport for your requirements. Limos are very popular for Christmas work parties. Why not book a limousine to take you and your staff/colleagues to your venue in style. Please contact us for more details about our Christmas limousine rental packages. Remember we offer a nationwide service so whether you need to hire a limo in London, Manchester, Bristol, Essex, Brighton, Nottingham, Birmingham, Glasgow or in fact anywhere in the UK, contact us today.